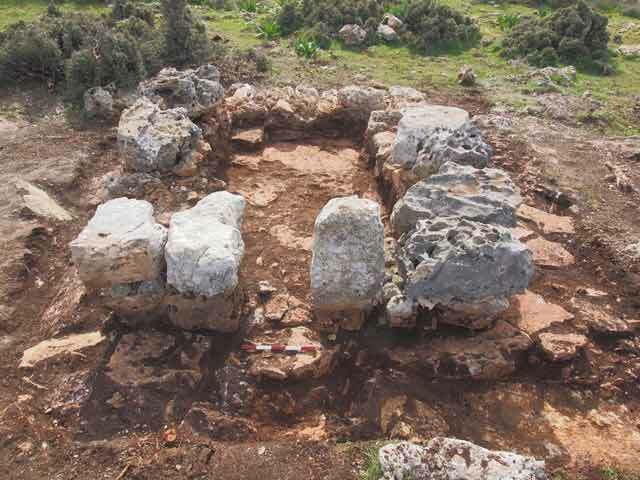 In January 2013, an excavation was conducted north-west of Shaqed (License No. 1-3-2013; map ref. 215430/709340; Fig. 1), prior to development. The excavation, on behalf of the Archaeological Staff Officer in Judea and Samaria, was directed by E. Aharonovich and U. Greenfeld, with the assistance of P. Portonov (surveying), S. Ammami (photography) and A. Harel (drawing of finds and drafting). 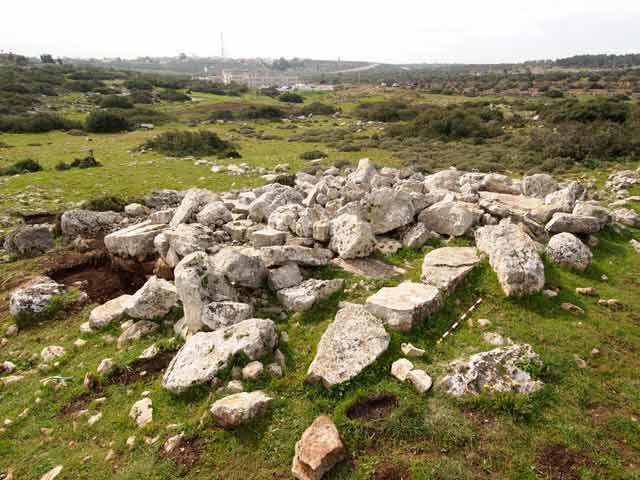 The excavation site is located in northwestern Samaria, on a gentle, terraced slope that is easily cultivated. In the Roman period, a town developed at Kh. Umm er-Rihan, c. 2 km northwest of the site. The town was briefly abandoned during the third century CE, and the settlement was renewed in the Late Roman and Byzantine periods (Dar, Tepper and Safrai 1986:119–120). Surveys carried out in the vicinity indicate that the area was inhabited throughout the Byzantine period (Zertal and Mirkam 2000:51–53). 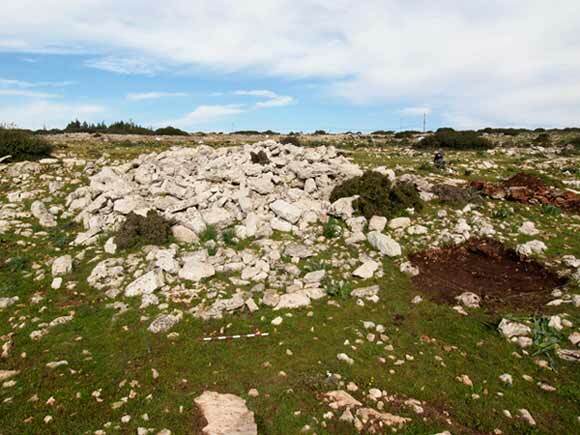 Five locations (L100–L500) with antiquities were examined, yielding two field towers, two stone clearance heaps and a building that probably served as a stronghold situated beside the road; all of the finds date from the Late Roman and Byzantine periods. Stone Clearance Heaps.Two stone-clearance heaps were examined (L100, L300). A trial square was opened around Stone Heap 100 (Fig. 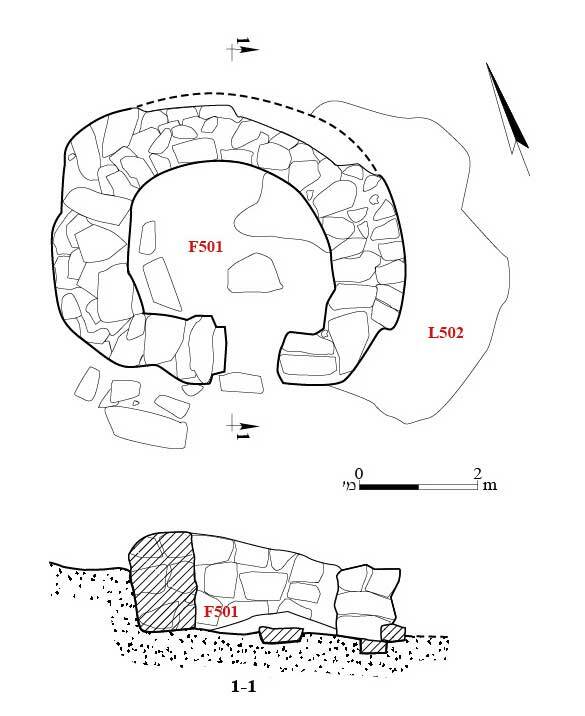 2) in order to determine whether it was a burial mound; No diagnostic items were discovered in the heap. 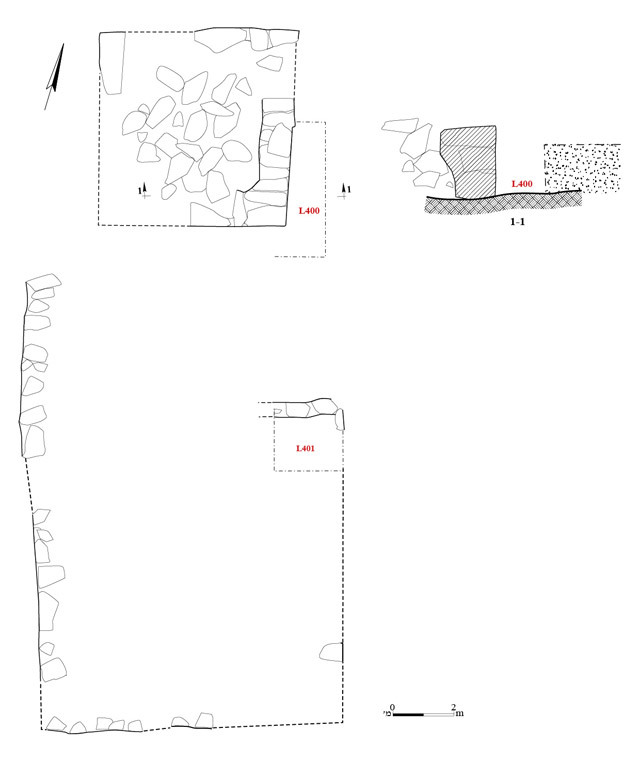 Stone Heap 300 was retained by a low wall (W301; Fig. 3); only one of its sides was exposed. No diagnostic finds were discovered in this heap as well. Field Towers. 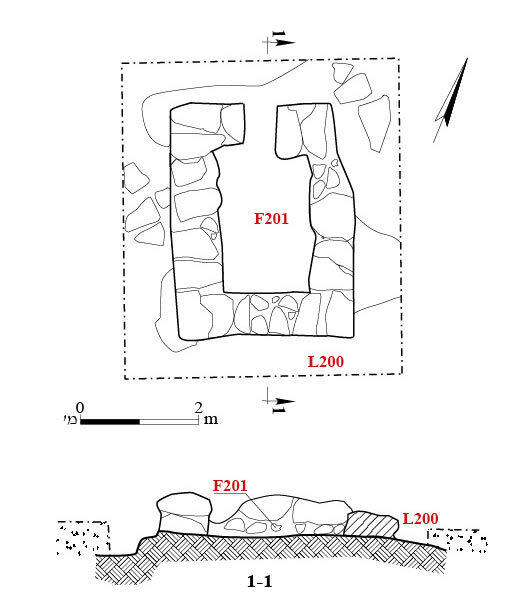 Two field towers of different plans were uncovered: A rectangular tower (L200) and a round one (L500), both built of ashlars and fieldstones. Tower 200 (2.8 × 3.7 m; Figs. 4, 5) was built on a leveled surface that served as a floor. Its walls were preserved to a height of 0.8 m, and its opening was set in its northern wall (width 0.5 m). Tower 500 (preserved height 1.6 m, inner diam. 3 m; Figs. 6, 7) had a floor of tamped earth with several irregularly shaped floor tiles. The tower’s opening (width 0.8 m) faced south. Jars (Fig. 8:1, 2), a cooking pot (Fig. 8:3) and a glass bottle (Fig. 8:4) dating from the Late Roman and Byzantine periods (late fourth–sixth centuries CE) were found in Towers. The field towers seem to have served for storage, guarding and temporary dwelling. Building (L400;6.0 × 6.4 m). The building was constructed of large, roughly hewn stones (Figs. 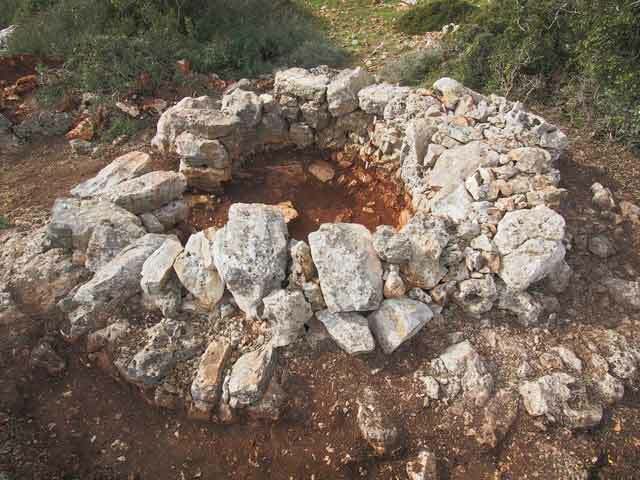 9–11) and was found covered with an impressive collapse. A probe excavated in the building’s southeastern corner revealed that it was built of stones arranged as headers and stretchers; a course of stones that was laid widthwise was also exposed. 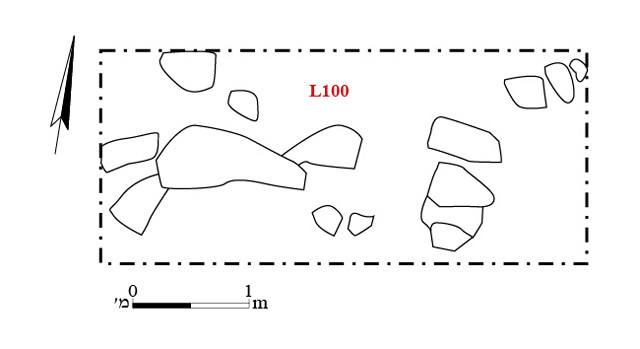 Remains of fieldstone walls that delineated a courtyard (9 × 15 m) were discerned south of the building. The courtyard was apparently bisected by a low wall. Two probes excavated in the courtyard yielded no diagnostic finds. Although Building 400 stands out prominently in the area, it was not documented in previous surveys. The structure differed from the Field Towers 200 and 500, in both size and quality of its construction. The heavy collapse attests to walls that rose to a great height and probably to partition walls as well. 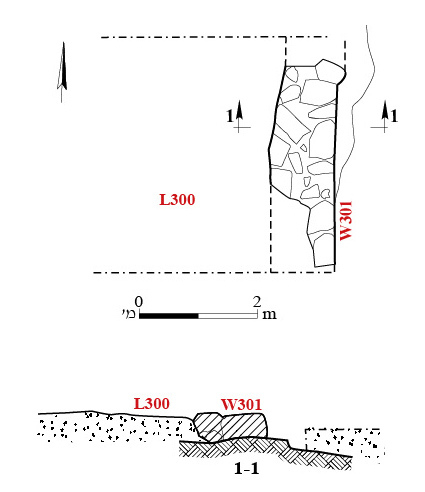 In the absence of a comprehensive excavation it is difficult to know whether this is a particularly large field tower of the type known in western Samaria (Dar 1986:93), or if it served a different function. It is possible that the structure was erected as a stronghold related to the network of Roman roads between Nahal ʽIron and Nahal Shekhem. 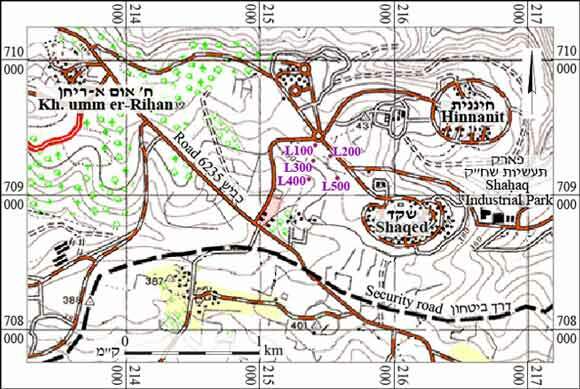 Sections of one of the roads that were found in the Menashe Hill Country Survey (Route C16) ran from Ya‘bed by way of Tura el-Gharbiyya, Nazlet Zeid, near Building 400 and to Kh. Umm er-Rihan (Zertal and Mirkam 2000:30). There was an intersection at or near Kh. 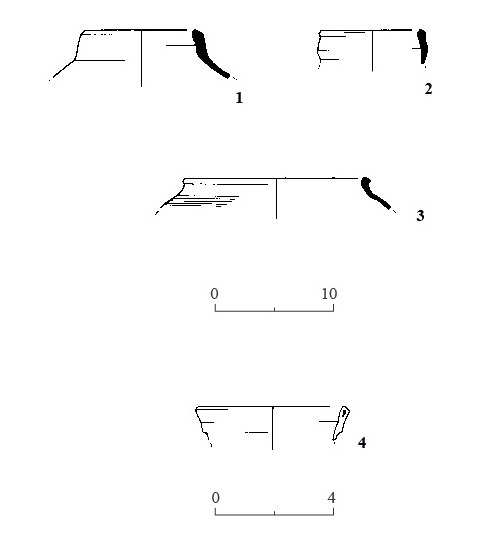 Umm Richan, whence the roads led north toward Wadi ʽAra (Dar, Tepper and Safrai 1986:21–22), northeast via ʽEinan to Taʽanakh and southeast to Jenin, which is Roman Ginae—Route C17 in the Menashe Hill Country Survey (Zertal and Mirkam 2000:30). It seems that most of the remains belong to the agricultural hinterland of the settlement at Kh. Umm er-Rihan, and add to the long list of other remains of agricultural activity in the northwestern region of Samaria (Maharian 2001a, 2001b; Aizik and Peleg 2009a; 2009b). Aizik N. and Peleg Y. 2009a. Field Towers and a Winepress Southwest of er-Rihan. In I. Yezerski ed. Excavations and Discoveries in Samaria (JSP 9). Jerusalem. Pp. 3–10 (Hebrew; English summary, pp. 25*–26*). Aizik N. and Peleg Y. 2009b. Field Towers in East Khinanit. In I. Yezerski ed. Excavations and Discoveries in Samaria (JSP 9). Jerusalem. Pp. 197–201 (Hebrew; English summary, pp. 46*–47*). Dar S., Tepper Y. and Safrai Z. 1986. Um-Rihan: A Village of the Mishnah. Tel Aviv (Hebrew). Maharian E. 2000a. Shaqed (West). HA-ESI 112:43*–44*. Maharian E. 2000b. Rehan. HA-ESI 112:44*–45*. Zertal A. and Mirkam N. 2000. The Manasseh Hill Country Survey III: From Nahal ‘Iron to Nahal Shechem. Haifa (Hebrew). 3. Probe 300, plan and section. 4. Field Tower 200, plan and section. 5. Field Tower 200, looking south. 6. Field Tower 500, plan and section. 7. Field Tower 500, looking west. 8. Pottery and glass artifacts. 9. Building 400, plan and section. 10. Building 400, looking north. 11. Building 400, looking southwest.